Created and originally posted by SHW on the Russian forum here. This is a repost of the HarbingerDawn's repost on this forum. This is a slightly updated version (with some new modules) running on the SE website hosting. A WebGL-capable browser is needed. It is in Russian, made in old editor and with SE 0.962, but good anyway. the lower-right slider changes the radius with respect to which the shield is curved (15-meter steps). Hyperdrive - old concept of the FTL engine (local time accelerator). NEW! Ring hyperdrive (6 different sizes) - new concept of the FTL engine (Alqubierre warp drive). NEW! Thick ring hyperdrive (6 different sizes) - new concept of the FTL engine (more physically realistic design). Shunting engine - small engine used rotation and fine movements of the ship. NEW! 5-directional thruster (use it instead of the old 'Shunting engine' module, because it has front- and backward-directed thrusters). Heat radiator (double-sided and one-sided - twice as heavy at the same performance). Propellant tank (Metallic hydrogen) - main reaction mass. Fuel tanks (De + 3He) - thermonuclear fuel (used for fusion reaction in main engines). Toroidal habitat - can be joined like train cars. Shuttle docking ring (two directions) - attaches to habitat unit. functional modules - these are inserted into the reference grid or attached to one of the side faces of the longitudinal beams. At all mounting points are pieces of longitudinal beam structure for further growth; If they are not needed they can be removed (Ctrl + left mouse click). Hyperdrive true - change to false if you ship has no hyperdrive. WarpBoostLog 12 - if your ship has a hyperdrive, this is the maximum boost exponent of the drive (i.e. multiplier to the physical velocity of the ship is 1012). Save the updated file and try out your ship in SE. You may change global orientation and offset of the model using a ship editor which is built-in in SE. Read more about this here. The new thruster module does it need to be placed somewhere in SpaceEngine in order to be used/loaded in game? Updated probe (one of the default ships). Very lightweight unmanned craft, capable to reach 33G acceleration (even thrusters are capable of 1.7G). Heavy gauss gun ship (600 thousand tons). Capable to reach 14G acceleration with reversible engines, which enable high manoeuvrability. 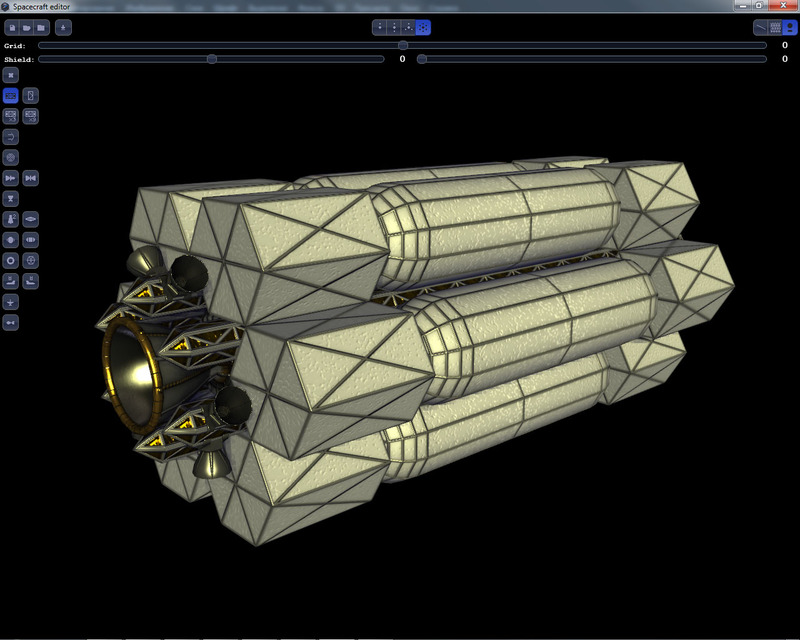 Does not has warp drive, it must be carried into the system by a large warp carrier (in development). 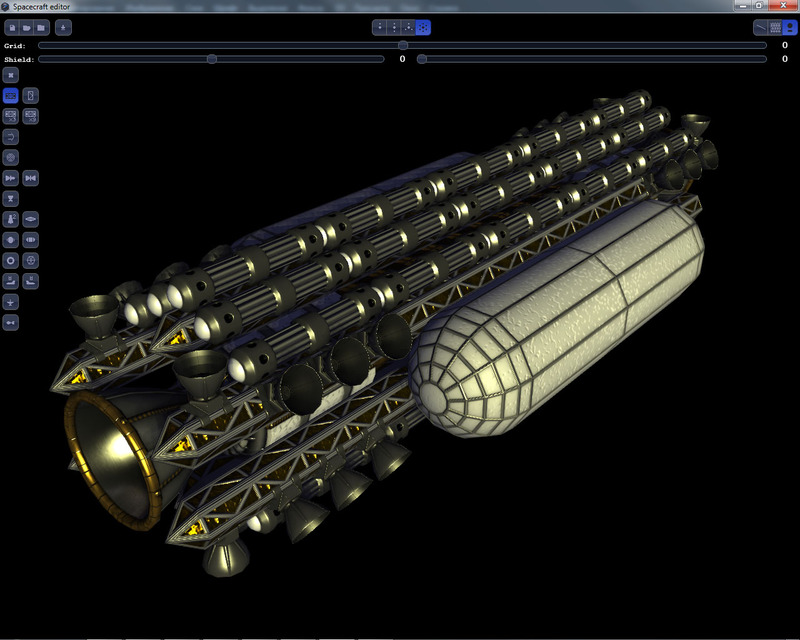 The gauss gun (coil gun) passes through entire ship along its axis (I used old warp drive module as a coils). This means that to aim the target, you have to rotate entire ship. This allows to protect it with shields only from the nose side. Shields does not cover the engines though, because they are reversible. The ship is capable to perform even if lose several engines. Shields are made from hi-reflective material to reflect enemy laser fire. The ship has a lot of shunting engines, but they are capable to achieve only 0.5G - the ship is too heavy. To make a dodge, you have to rotate the ship a bit and make a burn with main engines. This limits the ship's tactical capabilities, because it lose aiming on the target while doing this. The ship also has a several missiles to protect itself in a close-range fight. The ship has just two tanks with main propellent, which limits its delta-V capability. Taking into account powerful engines, tanks can be dried out within just few minutes. But this is okay for such type of ships, delivering to the target attack vector is performed by the warp carrier. The ship has little amount of heat radiators - they are unable to cool all 14 engines during a continuous acceleration at a 100% thrust. But this ship must never be used in such mode - real battle is performed in a series of short powerful burns. Losing of several radiators does not affects ship's performance significantly. 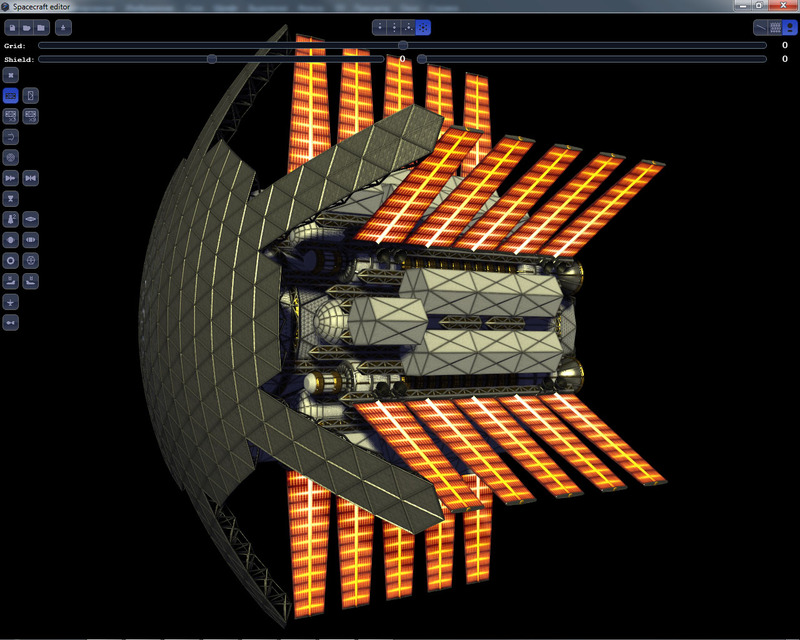 Note that the ship is rotated by 90° in the SE built-in editor (the rotation data is stored in sss). 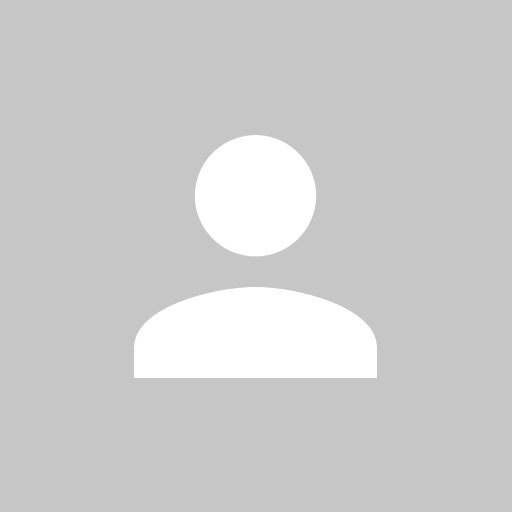 Take this into account if you want to re-import it from json. Originally named ''Explorer'' - not very unique name..
YAY new spacecraft editor / update! Wait - this isn't new at all! In fact it's old. Why has this one been linked instead of the more recent one from last November? BTW, where would one such as I go to make feature requests for this? I bring to you...The Fjordmaker! Source of the post Wait - this isn't new at all! In fact it's old. Yeah, where are the live cargo and military cargo modules from the update posted in the old forums? This one was made with the november ship editor update. Addition: Did I mention is outputs a crushing 27 Gs of acceleration? Hornblower,a better design but somehow I don't think it would have that level of capability given how much mass that ship has. Source of the post Hornblower,a better design but somehow I don't think it would have that level of capability given how much mass that ship has. Editor computes maximum acceleration by dividing summary thrust of all engines by summary mass of all modules, and writes it to sss file. Engines has ridiculous thrust of 6000 tons-force, but otherwise ships would be as slow as a probe powered by ion engines. 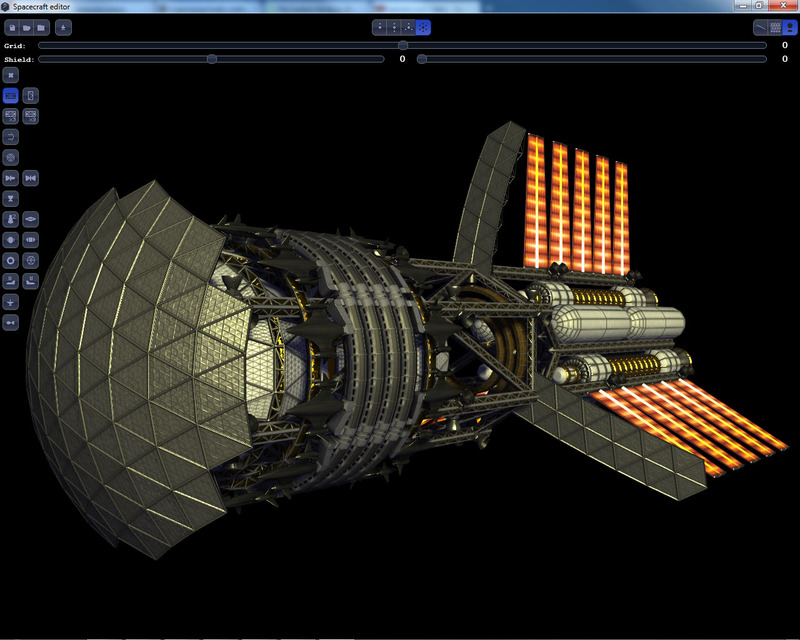 SpaceCraft editor 3.0 coming soon. So, i will be happy while ending it.